Before I started seeing D, I was definitely a savoury person over sweet. I would always go for a starter rather than a desert, however since then I have been converted to the world of puddings. D and I like love having treats…chocolate, ice cream, cake, anything loaded with fat and sugar but oh so very yummy. Our occasional treats though have turned into a nightly feature so I was delighted when the Tesco Orchard Programme was for fruit this time. I decided to use it as a start of healthier treats. I got a £4 voucher to spend on any fresh fruit. Instead of choosing my usual selection of bananas, apples and satsumas I decided to have a look at fruits I would never usually look at. 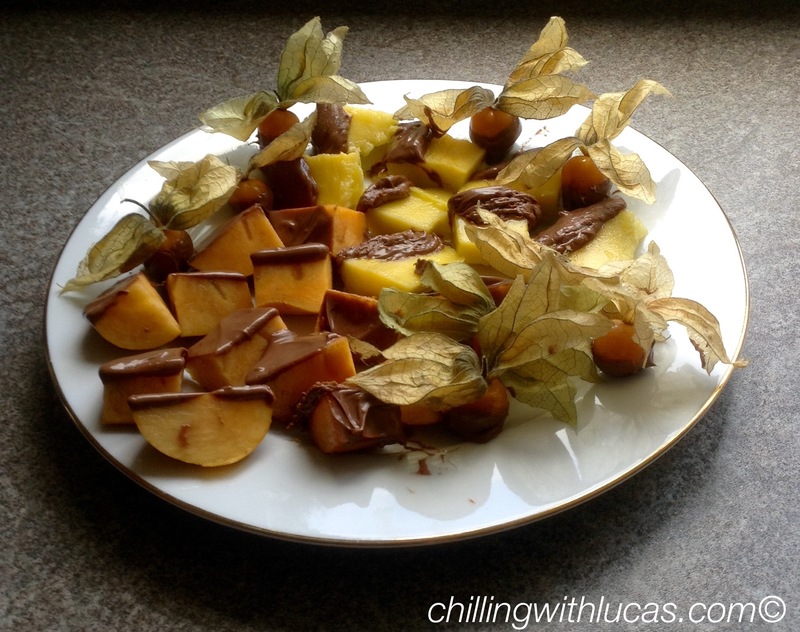 I chose physalis, mango and sharon fruit. I thought all of these would be worth a try at dipping in chocolate to encourage us to eat a slightly healthier treat. The physalis cost £1 for a 100g bag. They are a small yellow fruit that looks similar to a tomato and has papery leaves. Physalis is great for the immune system, containing vitamins A, B and C, calcium and iron. A 100g serving only contains approximately 60 calories so they are a great alternative for a snack. I didn’t enjoy these, I found them to be too sour for my liking but D loved them. One mango cost £1 but I bought a pack of three for £2.50 so I could use some for Lucas’ weaning. Mangos contain approximately 60 calories per 100g. Mangos are a great source of Vitamins A, B6, C and E. They are also rich in antioxidants and potassium as well as a moderate amount of copper. We both really enjoyed the mango and Lucas loved the puree I made. I can’t remember what the sharon fruit cost, I think it was £1 for a pack of two. These were my favourite of the three fruits, they have the texture of an apple but a lovely sweet taste. They are rich in antioxidants, Vitamins A, C, E and K. It contains approximately 70 calories per 100g. 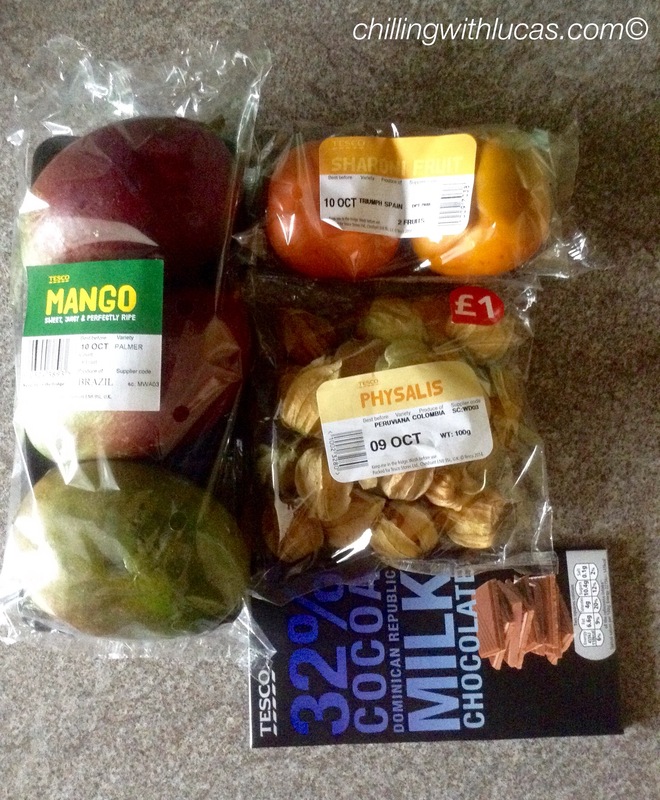 I dipped all three fruits in Tesco milk chocolate which was delicious.